The autoclave treatment is the best solution to protect the wood that will be used outdoors from biological threats that often appear in moist environments (insects, fungi, molds,…). 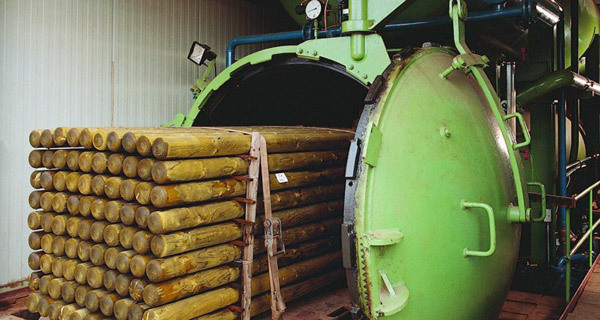 The autoclave is a tank used for the treatment of Scots Pine to its heart, with complete the saturation of its sapwood, using vacuum impregnation. After having spent some time in a kiln drying chamber, the Pine will be emptied of the the air particles it still contains, in an autoclave. Since this species of timber is particularly porous and permeable, an impregnation solution can be injected to remplace the air which is vacuumed out of it. This will confer durability to the wood, meaning resistance to moisture. The use of vacuum and pressure allows to inject treatments deep into the core of the Pinewood, in the most efficient manner. Depending on the situation and the type of wood, the autoclave treatment may prolong wooden products longevity up to 20 years. The know-how of the autoclave treatment is the guarantee of durability of garden wood products ! The goods that we offer are autoclaved at the sawmill, in Poland. The treatment operation thus directly follows the drying and planing operations. This is the way to ensure a high concentration of the treatment solution that will penetrate the wood to its heart. Class III – For wood products that will be in direct contact with water, but without water stagnation and without ground contact. Class IV – For wood products that will be in direct contact with water, with possible water stagnation, and ground contact. Any kind of custom treatment may be applied. Specify the treatment you like us to apply in the production of your order: type, concentration and color (green or brown). The standard treatment solution we use is Class IV impregnation with a green preservative product called “Tanalith”. This is an efficient, but non-toxic, safe, and environmentally friendly solution, that contains no chromium. All our treatments are applied according to the best practices of the industry, in compliance with French and European standards.